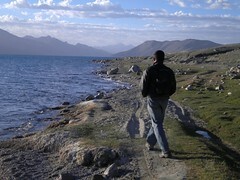 Using Leh’s traveler networking system we managed to find a shared tour to Pangong Lake and back. Of course, it wasn’t easy – we had to wait around for a couple of days until we found a group that wanted to leave in the near future and had 2 seats available. After signing up for it, we worried a little about the kind of people we would end up sharing the ride with. But since it was just a matter of an overnight trip, we knew we would be able to handle it. As it turned out, our fellow travelers were a cool bunch – a young Indian (a mallu!) lad traveling solo for the first time, a spiritual Italian girl who was truly experiencing India more than just traveling and a 60 year old British dame whom we nicknamed ‘Rockstar’ (for her fun, never-say-die attitude) by the end of the trip. At 8am in the morning, we piled into a luxurious Toyota Innova and agreed to take turns sitting in the last-row-seat as the winding Ladakhi roads can be a nauseating experience. 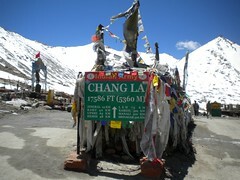 The ride to Pangong Lake included crossing what is advertised as the third highest motor-able pass in India – Chang La. At 5360m, it is fairly high and almost as cold and windy as the Khardung La pass. But what makes it a nicer stop is the Indian army’s friendly gesture to all its visitors: a free cup of tea! We were thrilled! We chatted with some of the army personnel and learnt that most of them were from South Indian regiments of the states of Kerala, Tamil Nadu and Andhra Pradesh; I spoke to a couple of them in Malayalam as well! The only sad part was that the toilets provided at the pass were in absolute filthy conditions – I wish they would do something about that! Just before we got to Pangong Lake, our driver suddenly pulled to the side of the road and pointed to an opening between two mountains in the distance to our right. There, shimmering in the afternoon light, was a serene mass of blue water that looked totally unbelievable! We stared at it for a few seconds before realizing that it was Pangong Lake that we were looking at. Apparently, this is the first glimpse of the lake when visitors drive up from Leh. We were completely enthralled – it looked so gorgeous that it almost seemed unreal! Further along the way we saw a large herd of yaks plodding across the valley floor. We immediately requested the driver to stop the car and got out to take some pictures. Two young lads were herding the yaks and they offered to let us come close and take some pictures. They told us that there was a film being shot close-by and the yaks had been used in some parts of the filming; they were on their way home after a hard day’s shoot. The lads allowed us to touch and even hold the younger yaks while the rest of us went into a frenzy of clicking pictures. 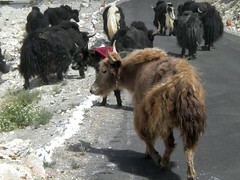 The yaks were quite impatient though and didn’t hang around for long; they just wanted to get back home! When we finally got to Pangong Lake, everybody in the car was almost overwhelmed with its beauty. Speaking for myself, I can honestly say that I haven’t seen a more beautiful stretch of water in my life before! Before coming here, we had read about the lake and how gorgeous it is, but nothing can truly describe the beauty of the place – you’ve got to see it to understand! It’s probably the color of the water – a perfect, silvery blue – or the beautiful, brown mountains that surround it, but the landscape looked pristine and perfect! Before looking for accommodation for the night, we were driven right up to its edge where we all took a few moments to sit down and take it all in. Many travelers, short on time, do a day trip to Pangong Lake from Leh. Although that’s absolutely doable, it will probably be one heck of a tiring trip as the drive takes almost 6hrs each way. Moreover, the lakeshore deserves much more than the couple of hours it gets during a day trip. To stay overnight home-stays are available in the neighboring village along with some lakeshore hotels. We looked around and found an expensive resort right at the banks of lake but eventually opted for a budget, tented accommodation, which was also within walking distance of the lake. For Rs.400, each tent housed 2 single beds. A couple of western-style toilets were to be shared. Basic food (Daal, Rice, sabzi, Maggi, Bread & Omelets) could be ordered and would be served in a small, makeshift tent or outside where a couple of mismatched tables and chairs were laid out. It wasn’t a luxurious setup by any means but served the purpose for one night. 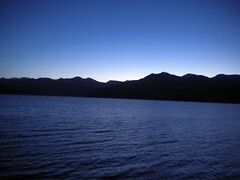 In the evening, we walked out towards the lake and east along its southern rim until the sunset and the lake took on a very different, dark bluish tint – it was hard to believe but it actually looked more gorgeous than it had in the morning! It got quite cold and windy as well but the place was too darn pretty so we kept walking and then sat down on some large boulders gazing out at the water. We were accompanied by some of our car-mates too and it was quite nice to exchange travel stories and experiences. Overall, it was one of our nicest evenings in Ladakh! of seeing the sunrise. We were told that it would be around 5am but by the time we caught sight of the first glint of the sun coming up behind the mountains, it was almost 6:30! It wasn’t as spectacular a sunrise as we had hoped but it was totally worth being out there and enjoying the purity of the morning air! After a hearty breakfast, we left the lake around 10am and were in Leh town by late afternoon. We paid Rs.1,200 per head as car charges, which was quite nominal for a 320kms overnight, round trip. Moreover, sharing the tour was not only cost-effective but also a nice way to meet fellow-travelers who come to Leh from all over the world. Of course, I think we totally lucked out by getting to share our ride with some really nice and interesting people!